Mmmm….Remember Thin Mint Girl Scout cookies? Living gluten free, dairy free, soy free, and nut free means no girl scout cookies for us in our house but that doesn’t mean we can’t come up with a substitute! 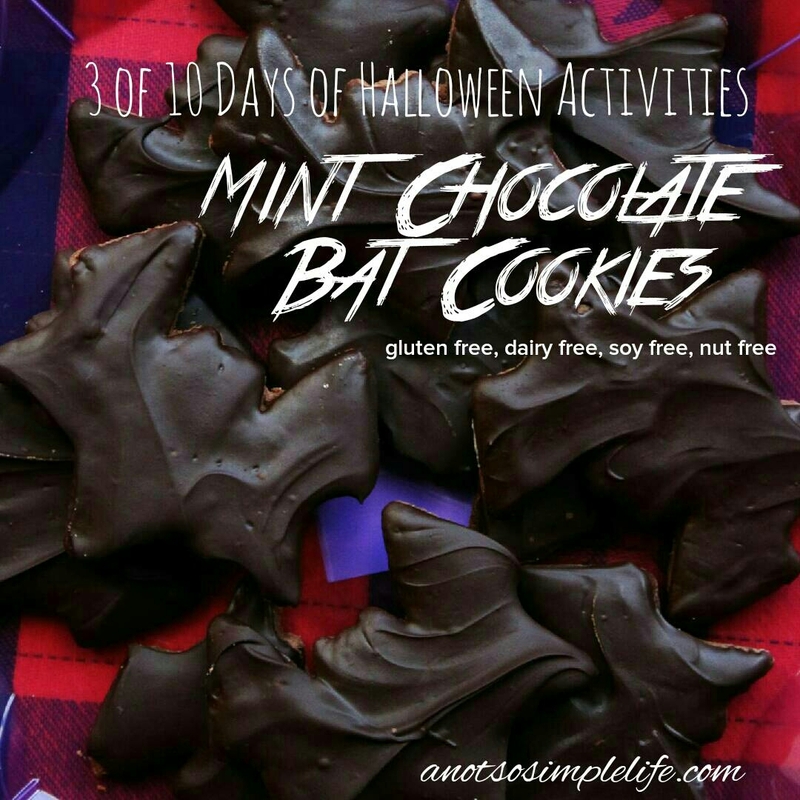 These chocolate mint bat cookies did the trick! They’re also activity number 3 in my 10 days of Halloween activities series. 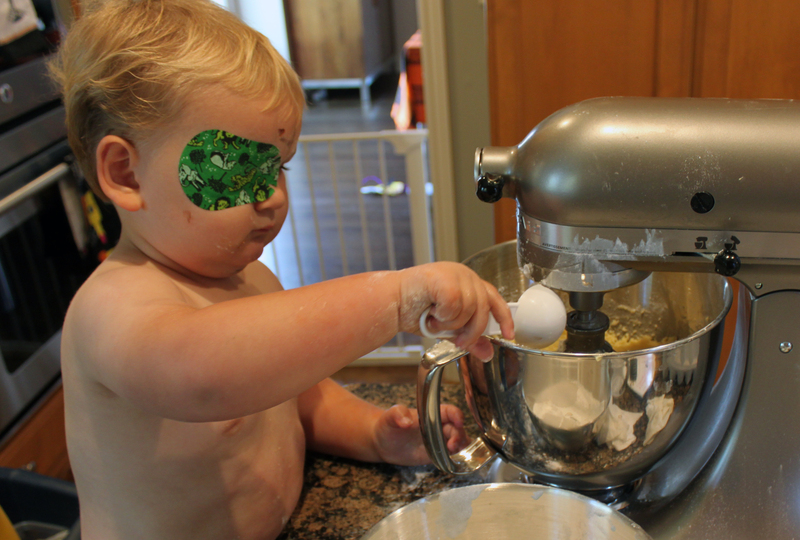 We’ve done a few days of painting activities so I decided it was time to bake. My little man just recently became obsessed with mint after tasting an Altoid. Yuck! I hate them, but his dad likes them and keeps them in his car. Little man recently started saying “want one” which he now does everytime we’re in Dad’s car. Then, “Mom bite” because he doesn’t want a whole one, he wants half of one because a whole one is too strong. Anyways, this newfound love of mint is what made me decide to bake these gluten free, dairy free, soy free, nut free (optional egg free) Chocolate mint cookies as our Halloween cookies. I came up with this recipe last year during Girl Scout Cookie season when I was craving Thin Mints. *only add the xanthan gum if the flour blend you’re using doesn’t already have it. 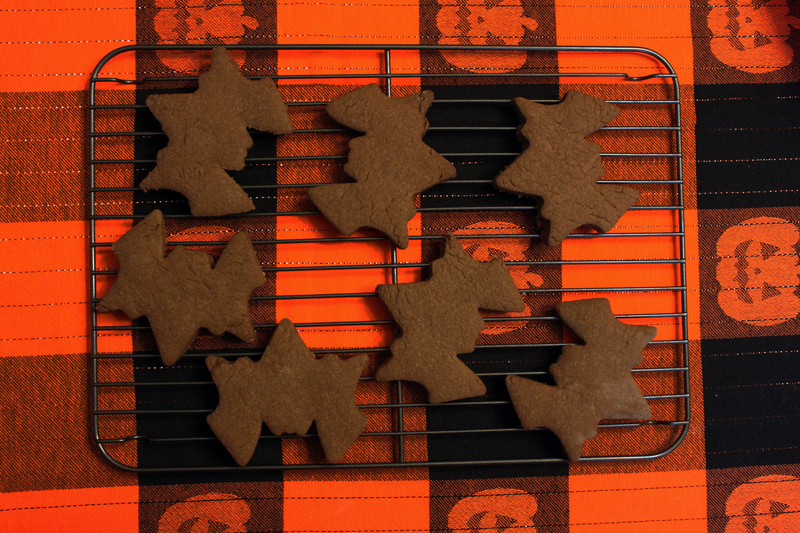 Don’t forget your Halloween Cookie Cutter Set – This one is exactly like the one we used for the bats that is actually from my childhood! I can’t believe they haven’t changed the design! In a large bowl, beat softened butter and sugar until thoroughly mixed and soft and fluffy (about 1 minute). Add egg (or arrowroot mixture) and peppermint and beat until smooth. In a separate bowl, mix flour blend, cocoa powder, xanthan gum, salt, and baking powder, then add flour mixture to butter mixture 1 cup at a time, beating briefly to incorporate. Preheat your oven to 350 degrees. 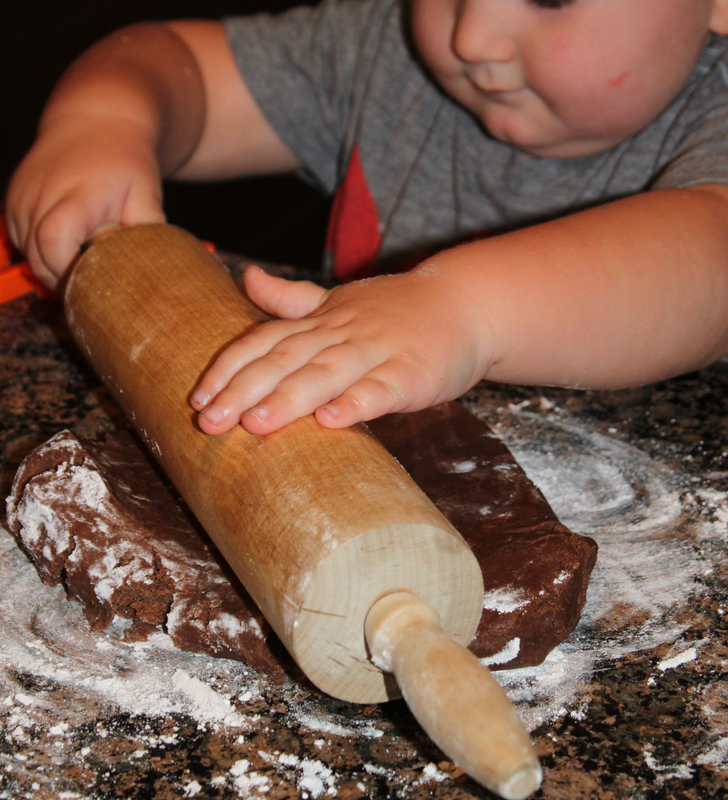 Flour your counter and a rolling pin and roll dough out to about a 1/4 inch thickness (or maybe 3/8 inch). Stamp out all of your bats (or whatever else you choose to make). Place on a cookie sheet and back for 12-13 minutes. 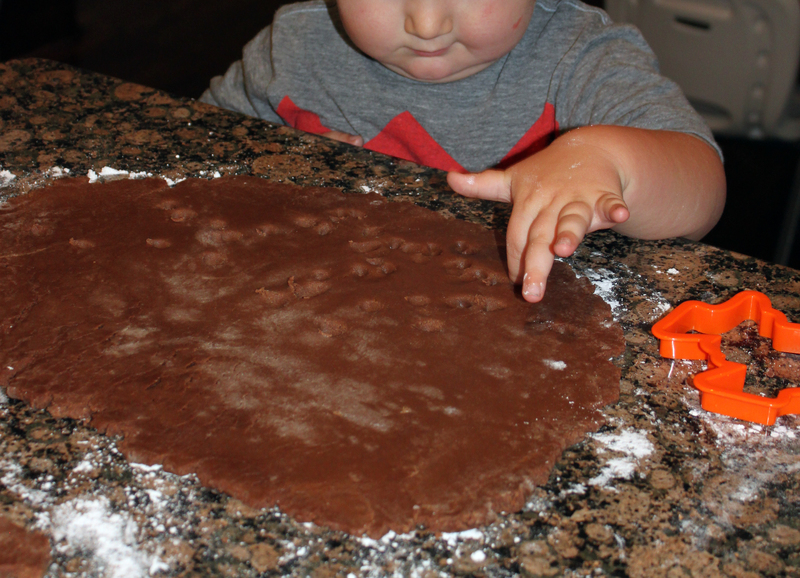 This little man was a great helper, if poking the dough with your fingers and stealing and eating pieces of uncooked cookie dough is helping.